In 2012, my husband’s sister came to visit us with the sisters from the Church of Almighty God. They witnessed to the work of Almighty God—the Lord Jesus’ second coming—in the last days, and communicated with us why believers in the churches became cold in their faith and why preachers had nothing to preach. They said that God has done a new work and ceased working in the churches of the Age of Grace and that only by following God’s new work could we gain God’s leadership and the Holy Spirit’s work…. What they conveyed sounded reasonable and supplied me with much strength. I couldn’t help recollecting the scenes of my attending meetings in our church: Each time I went out full of faith and yet came back discouraged and disappointed, because the preachers were unable to deliver new light, there was no enjoyment in the meetings, and I couldn’t receive any supply in the spirit. I always felt as if we had been abandoned by the Lord. I thought to myself: Can it be that God has done a new work, just as they say? If so, I must seek actively. Therefore, after their first communication and witness, I decided to listen carefully to them when they came again. One morning several days later, my husband and I went to plant beans in the field after breakfast. While working I told my husband, “After listening to the fellowship of the sisters in the Church of Almighty God, I feel what they said was full of enlightenment and far better than the sermons given by the priests in our church. We’d better listen again if we can.” He nodded in agreement. Just then, I caught sight of co-workers Wang and Li of our church hastily approaching our field. Facing us, co-worker Li said not nicely, “You two haven’t attended meetings quite a few times. I heard you had listened to the messages of the Eastern Lightning.” I looked at them and said nothing. My acknowledgment in silence set co-worker Wang saying in astonishment, “It seems that you’ve really believed in the Eastern Lightning!” I said earnestly, “Sister Li, Sister Wang, you’d better make an investigation. I feel it’s of great benefit and enjoyment to listen to the sermon given by the sisters in the Church of Almighty God. 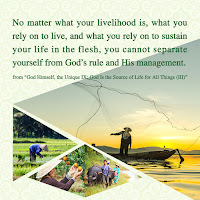 They are unlike the preachers in our church, who are always long-winded and repeating themselves and whose sermons can’t offer me any enjoyment other than drowsiness.” I standing on the side of the Church of Almighty God, co-worker Wang glared at me and said, “Who was it that saved you when your illness was at its worst? It was the Lord Jesus! But now, you are leaving the Lord and turning to Almighty God. It’s ungrateful of you to do so.” Hearing what she said, I somewhat hesitated: Yeah, it was the Lord Jesus who saved me and gave me a second life when I was haunted by diseases and dying. If I leave the Lord, am I not an ingrate without conscience? Nonetheless, I indeed feel it good to listen to what the sisters in the Church of Almighty God preached. If I don’t follow, what if I miss the salvation of the Lord’s second coming? While I was thinking, co-worker Li went on saying, “Sister Fang, we are both believers in the Lord. I will never harm you. You can’t forget the Lord’s grace and turn to believing in another God. That will disappoint our Lord! …” Their persistent persuasion made me change my mind: Such great grace has the Lord given me that I really can’t leave Him! Thus my husband and I promised them to attend meetings in our church. After that, the brothers and sisters in the Church of Almighty God came to find me several times but I kept refusing to communicate with them. During that time when I had meetings in our church, I had no strength when listening to brothers and sisters singing and I just couldn’t listen to what the preachers said. So I always missed the presence of the sisters in the Church of Almighty God. Their sermon was beneficial and nourished my spirit, inspiring me with faith. Although I first met them, I felt as if they were my family. When having dinner, I said to my husband, “We’d better go to find the sisters in the Church of Almighty God. Their sermon sounded enjoyable. You see, there are some talking about domestic trivia and some dozing off during meetings in our church. We can’t draw any enjoyment from the preachers’ preaching. Such a church is without the work of the Holy Spirit.” Nevertheless, my husband said, “There is no difference in where to believe in the Lord. Besides, we can’t leave the Lord Jesus.” Our views were divided and I was torn, not knowing which was right. During that time, I often saw my sister-in-law had meetings with brothers and sisters in the Church of Almighty God and that she hummed songs daily, looking quite happy. In contrast, I just couldn’t cheer up but felt listless all day long. I thought: We both believe in God, but why is my sister-in-law so happy while I seem to live in the darkness of being forsaken by the Holy Spirit? The more I possessed such feeling, the more I fancied going to their church to listen again. However, I was too embarrassed to express myself to her, fearing that she might have an opinion of me. Consequently, I didn’t go and engage with her all along. One day, wanting to listen to hymns, I switched on the recorder and accidentally heard the hymn “Grace in Grace,” whose lyrics went like this, “Lord, You have delivered me out of so great a death, sending me onto the road of life. Lord, You will deliver me from myself, free me from the control of sin, and save my soul-life. Walking a humble path, dying to myself, and possessing resurrection, freedom and relief. In the past, I went for special gifts and grace. Today, I will gain You. …” Hearing out the hymn, I felt much brightened. Thinking back to the past, I gained the Lord’s grace. Nowadays, the sermon that the sisters in the Church of Almighty God preached gave much enjoyment to me. It’s probable that Almighty God is the returned Lord Jesus. They might be preaching the true way. Why not seek? If by any chance it’s the work done by the returned Lord Jesus, won’t I miss the chance of gaining God since I don’t seek? Thereupon, I prayed to God day after day, “Lord! People from the Church of Almighty God preached the gospel to me and I took enjoyment in their sermon. They saidAlmighty God is Your second coming. Without discernment, I’m afraid of walking the wrong path and departing from You, but I don’t want to miss the work of Your return, either. May You guide me!” One day, it leaped into my mind that there was a book of God’s word left to me by the sisters in the Church of Almighty God. 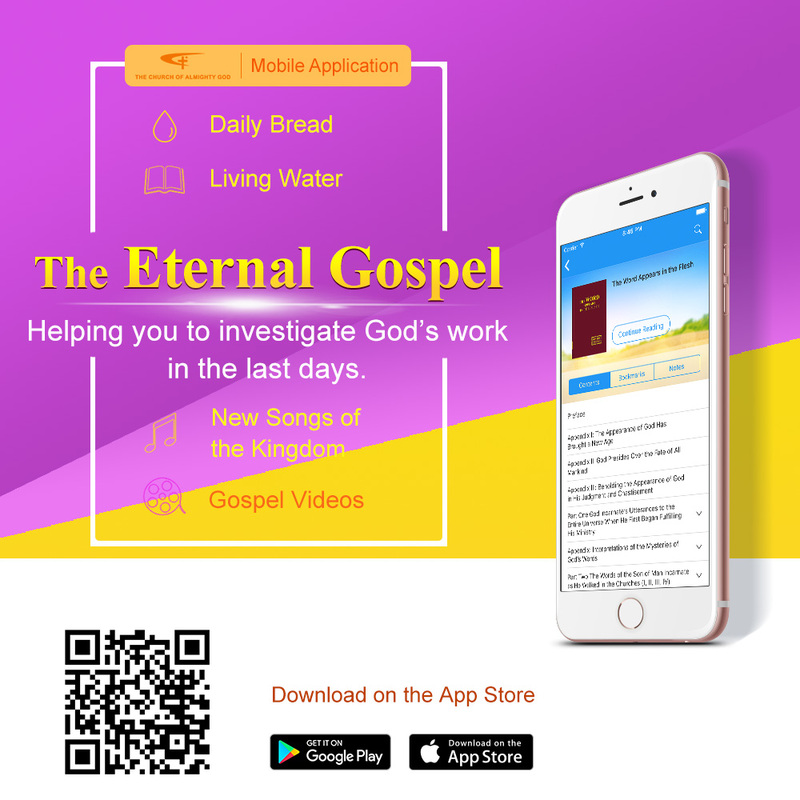 I found it straight away and read a passage of God’s word, “Since man believes in God, he must closely follow the footsteps of God, step-by-step; he should ‘follow the Lamb wherever He goes.’ Only these are the people who seek the true way, only they are the ones who know the work of the Holy Spirit. People who slavishly follow letters and doctrines are those who have been eliminated by the work of the Holy Spirit” (“God’s Work and Man’s Practice” in The Word Appears in the Flesh). God’s words set me pondering: Believers in God must closely follow the footsteps of the Lamb, or they are probable to be eliminated at any time. The sermon from the Church of Almighty God furnished me with enjoyment. And have a look at my sister-in-law: Ever since she began to attend meetings in the Church of Almighty God, she has beendelighted every day. By comparison, she is likely to have followed the footsteps of God. At that moment, I recalled what the Bible says, “These are they which follow the Lamb wherever he goes” (Revelation 14:4). Aren’t Almighty God’s words in line with the words in the Bible? Almighty God may be really the returned Lord Jesus. Having listened to God’s words and the fellowship of my sister-in-law, I beat my forehead and sighed, “Oh! What a fool I am! Jehovah, the Lord Jesus and Almighty God are one God. Belief in Almighty God is not departure from the Lord. I had no enjoyment when listening to sermons in our church these days. Seeing you happy every day, I really envied you at heart but I daren’t contact you, for fear of offending the Lord. I felt dark inside and had nowhere to turn. Thank God for His leadership. I fully understand that Almighty God is the returned Lord Jesus through your fellowship.” Hearing me say this, my sister-in-law smiled. Later on, my sister-in-law taught me some hymns of the Church of Almighty God. The more I sang, the more my strength increased. I learned several hymns quickly and felt heartily glad. I was completely certain that Almighty God is the returned Lord Jesus, and vowed never to leave Him. May all the glory be to Almighty God!